New pond owners may be unfamiliar with the differences when it comes to pond repair vs. pond renovation. Pond repair involves fixing things which are damaged, such as pumps or filtration systems, while pond renovation involves upgrading the pond through the addition of new features which make it more aesthetic or functional. Ponds, like all complex physical systems, are subject to entropy. Put another way, they will wear out over time, if not maintained regularly. They will leak. The filter unit could become disconnected from the liner. The pump may break. The sheer number of problems that can occur within a pond are endless, and if you own one it isn’t a question of if something will go wrong, but when. The only question is how serious the problem will be, and whether or not you’re prepared for it. The idea behind pond repair sounds simple enough, but too many pond owners dismiss it out of hand. They may become lackadaisical with regard to regularly monitoring the pond and performing the maintenance that is required. Overtime things wear out and debris builds up, and before they realize it they have a serious problem on their hands which could potentially threaten the pond and every living organism within it. If pond maintenance is done regularly and thoroughly repairs will be minimal and affordable. If not then repairs will be extensive and require significant amounts of money. Pond renovation is a bit more complex than pond repair. If a pipe is broken then it needs to be replaced, which is straightforward. With pond renovation, you will be changing things that you don’t like or adding new features you’d like to have. This isn’t as straightforward as fixing a broken pipe, because you have to decide exactly how you want the pond to be renovated. Just as there are an infinite number of things that can go wrong with your pond, there are also an infinite number of ways in which it can be renovated. A pond renovation project is essentially an upgrade. Perhaps you want to add more space, more plants or fish. Some owners add waterfalls, statues or LEDs that can produce dazzling effects after dark. The key difference between pond repair and pond renovation is that renovation requires greater creativity. While it does take a degree of creativity to solve many of the problems that can occur within a pond, renovation is more of an art form. It is for this reason that so many pond owners hire the services of the professional. It isn’t just because pond renovation is immensely time consuming (that is certainly a part of it). It is also because renovation requires a keen eye and a fundamental understanding of landscaping and design. This is a skill that cannot be acquired overnight; it is something that has to be developed. 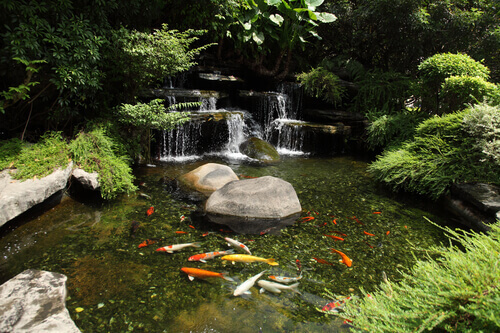 The best time to renovate your pond is when you want something bigger, more functional and more pleasing to the eye.